If you’ve ever planted a tree in your backyard, you know it takes a bit of hard work to dig a decent hole, position the plant, cover the roots with soil and then water it on an ongoing basis to ensure its survival. A team of dedicated people have done that over 5,000 times at Mt Etna Caves National Park! Mt Etna’s habitats are in much better condition thanks to the help of a Green Army team, who have spent the past six months helping restore habitat connectivity and increasing the extent of semi-evergreen vine thickets (SEVT) at the project site, north of Rockhampton. Fitzroy Basin Association Inc. (FBA) Senior Project Officer, Cassandra Tracey said the project site is adjacent to a threatened ecosystem consisting of remnant, good quality SEVT (dry rainforest). 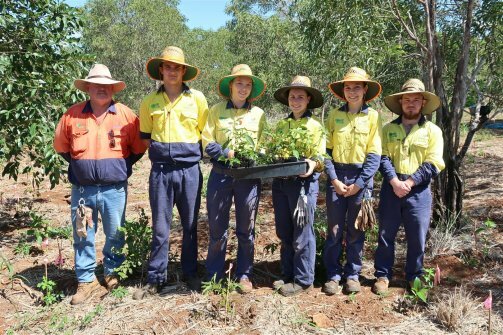 “In the past six months, the Green Army team has planted over 4,000 trees, shrubs and vines, and with over 1,000 planted in addition to this at school and community planting days and by the Skilling Queenslanders for Work team, it brings the total to over 5,000 for this year – a fantastic result,” Mrs Tracey said. “The project is part of the 20 Million Trees project, and is supported by FBA and the Australian Government’s Green Army Programme through funding from the Australian Government’s National Landcare Programme. “By June 2017 we will have planted over 7,500 trees, shrubs and vines at Mt Etna. With 6,500 planted to date, we are well on track to meet our ambitious target. Mt Etna Caves National Park is home to many threatened species, such as ghost bats, and over 80 per cent of Australia’s little bent-wing bats. “The project will improve the foraging habitat for the park’s significant bat populations by improving the habitat immediately adjacent to their breeding and roost sites. For more information about this project or our region’s threatened plants, animals and habitats visit www.fba.org.au.